Last week, when I logged into my Mint.com the first time in several months, I was shocked by how Mint categorizes the expenses downloaded from my Bank of America Checking account. I don’t know exactly how Mint processes the transactions, but it is just unacceptable to me that a popular financial product that is used by more than 1 million users to track their finance treats a credit card payment to Chase as spending on alcohol. I then wrote a post complain Mint.com’s problem. From readers’ comments on the story, it’s quite clear that I am not the only one who experiences this problem. Those who use the tool rather frequently also saw their expenses being categorized incorrectly. There are also readers came to Mint’s defense with the argument that since Mint is free, it’s not perfect and errors like this happen and can and should be tolerated. Well, I don’t think being FREE is the excuse of doing such a poor job. So what I did was to check another popular and free web-based money management too to see how they compare to each other in handling transactions from the same BofA account. The one I chose is Yodlee and like Mint, I haven’t used the account since it was set up months ago. Thus, the comparison is equal. And here’s what I saw in Yodlee’s Expense Report. It’s not perfect either, but at least I don’t see hundreds or thousands spent on alcohol, entertainment, or sports. Instead, I see mortgage payments and spending on education (Ohio 529 Plan Investment). And when I go to the details of the transactions, the difference between the way Mint and Yodlee process each transaction becomes clear. Unlike Mint, the description of the transaction in Yodlee is more complete. In addition to the Payee’s name, Chase, it also information like payment ID, individual name, and company ID. Basically, the description in Yodlee is exactly the same as the description provided by BofA. In Mint, the description of the transaction only shows as “Chase”. Of course, the comparison is far from comprehensive and in order to arrive at the conclusion which one is better, I need to take a deeper look at both. But from what I can see now, Yodlee at least does a better job categorizing the transactions. No wonder many financial institutions use Yodlee too. BTW, there’s another free online personal finance software called Buxfer. I haven’t looked at it yet, so I don’t whether there’s any difference between Mint.com, Yodlee and Buxfer and which one is better. 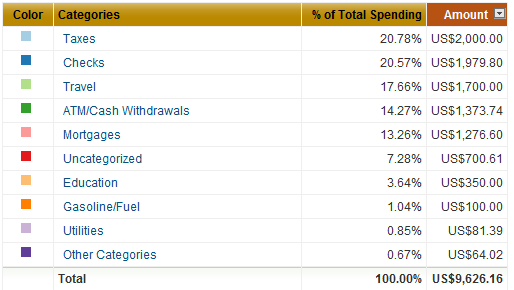 by the way, in Yodlee you can also set rules to automatically classify expenditures. For example, if you have buy gas at a grocery store like safeway, you might see an expense like “safeway gas bar” filed under groceries. But, you can set it up so that any time “safeway gas bar” comes up, it will be automatically filed under gas instead. I totally agree as aI performed the same exercise with Mint and Yodlee this week after not logging in for some time. Yodlee is more robust and does a better job at categorizing transactions and giving me more useful tools to understand just how I am spending my money. Will you please provide a date for your original article/post? I have no idea if this was written in 2010 or 1010, for goodness sakes. I tried both of them and I think also like Yodlee better. Less intervention, more accurate.